Spirits Having Flown is the fifteenth album released by the Bee Gees. It was the group's first album after their collaboration on the Saturday Night Fever soundtrack. The album's first three tracks were released as singles and all reached No. 1 in the US, giving the Bee Gees an unbroken run of six US chart-toppers and tying a record set by The Beatles. It was the first Bee Gees album to make the UK top 40 in ten years (not counting the soundtrack for Saturday Night Fever), as well as being their first and only UK No. 1 album. It has sold 20 million copies worldwide. Spirits Having Flown marked the tail end of the band's most successful era, prior to a severe downturn in the early 1980s when they would endure a near-total radio blackout (particularly in America) that Robin Gibb would refer to as "censorship" and "evil" in interviews. At the start of 1978, Barry Gibb produced the album Shadow Dancing by Andy Gibb. By February, Barry wrote the title song for the film Grease performed by Frankie Valli also in February, another Barry Gibb composition in 1977 "Ain't Nothing Gonna Keep Me From You" was recorded by Teri DeSario. By March, the Bee Gees has started to record this album. The Bee Gee's ninth US number one single from 1979. It topped the chart for three weeks. Problems playing this file? See . Co-producer Albhy Galuten recalls Spirits Having Flown as being created primarily by Barry Gibb, Karl Richardson and himself putting in long days and nights at Criteria Studios. Blue Weaver recalls others being involved. Both agree that Robin Gibb was active behind the scenes in songwriting and offering feedback to the recording process, but Maurice Gibb contributed probably the least he did on any Bee Gees album. Not only was his alcoholism sapping his creativity, but he was having back pains finally diagnosed in 1980 as caused by a bad disk. He said that he would be doing bass work and without his knowledge, Barry and Robin would hire in someone else to play parts that he was supposed to be playing; however, he said that whilst he played fine, neither Barry nor Robin could rely on him. In the recording phase, Robin and Maurice now mainly played the role of backing and harmony vocalists, and even in that capacity Barry did many of the vocal dubs himself as he went over and over the recorded work. Robin contributed one lead vocal ("Living Together") which was sung in falsetto with Barry providing alternating lead vocals in his normal register. This was Robin's least amount of lead vocals on any Bee Gees album with the exception of 1970's Cucumber Castle, for which he was not part of the group at that time. As with the last four Bee Gees albums, Maurice did not have any lead vocals. The Bee Gees had been effectively typecast as a disco group after Saturday Night Fever, and in a 1978 interview Barry remarked "People think we're just about disco now. Of course that's not true. If you look at the SNF soundtrack, there's some dance music, but we also have ballads like More Than A Woman." In an attempt to counter this typecasting, the first single from Spirits Having Flown was the ballad "Too Much Heaven". The horn section from Chicago (James Pankow, Walt Parazaider and Lee Loughnane) made a guest appearance on this album. At the time, they were next door working on the Chicago album Hot Streets. Thus the Bee Gees would return the favour as they appeared on Chicago's song "Little Miss Lovin'" and their keyboardist Blue Weaver appeared on "No Tell Lover". The Bee Gees also recorded "Desire" for the album but it was rejected and instead released as a solo single by their brother Andy. Spirits Having Flown was released in February 1979, with full page ads in Billboard magazine and Rolling Stone, which gave the album a lengthy, but positive review. It topped the album charts in several countries, including both the US and UK. Its three singles "Tragedy", "Too Much Heaven" and "Love You Inside Out" all topped the charts in the US. 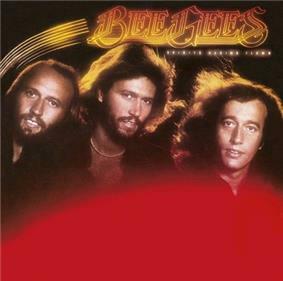 The title track was also released as a single in the UK and a few other countries in December 1979 to promote the Bee Gees Greatest compilation. The album sold over 20 million copies worldwide as of 1997. The RIAA lists the album as having been certified "platinum" (1,000,000 sold), but RSO never had the album re-certified. Many articles and websites cite the album as having sold as much as 6,000,000 copies in the U.S. alone, but these results are un-official, which is why the album does not appear on many 'best selling' lists, including WorldHeritage's List of best-selling albums. Sprits Having Flown was voted Best Pop/Rock Album of 1979 at the 1980 American Music Awards ceremony. All tracks were written by Barry, Robin & Maurice Gibb. Robin Gibb – vocals, lead vocals on "Living Together"
^ ("...being released world-wide tomorrow...") Green, Gavin (4 February 1979). "The Bee Gees Latest Album Less Feverish But A Goer". ^ Rodriguez, Juan (27 December 1979). "Top Hits of 1979". The Montreal Gazette. Retrieved 3 April 2014. ...the perfect fusion of disco, soul and pop. ^ a b Brennan, Joseph. "Gibb Songs: 1978". Retrieved 13 January 2014. ^ Eder, Bruce. "Allmusic review". Allmusic.com. Retrieved 17 August 2012. ^ "CG: Bee Gees". Robert Christgau. Retrieved 17 August 2012. ^ "Spirits Having Flown"Bee Gees – (ASP). Austrian Charts (in German). Hung Medien. Retrieved 12 October 2011. ^ "InfoDisc : Tous les Albums classés par Artiste > Choisir Un Artiste Dans la Liste" (PHP) (in French). infodisc.fr. Retrieved 12 October 2011. ^ a b "Hit Parade Italia – Gli album più venduti del 1979" (in Italian). hitparadeitalia.it. Retrieved 12 October 2011. ^ a b Oricon Album Chart Book: Complete Edition 1970–2005. Roppongi, Tokyo: Oricon Entertainment. 2006. ^ "Spirits Having Flown"norwegiancharts.com Bee Gees – (ASP). Retrieved 16 January 2012. ^ "Spirits Having Flown"Bee Gees – (ASP). Swedish Charts (in Swedish). Hung Medien. Retrieved 12 October 2011. ^ "Spirits Having Flown"Chart Stats – Bee Gees – (PHP). ^ "Album Search: Bee Gees > Spirits Having Flown" (ASP) (in German). Media Control. Retrieved 16 January 2012. ^ "Austriancharts.st – Jahreshitparade 1979" (ASP) (in German). Hung Medien. Retrieved 4 October 2011. ^ "RPM Top 100 Albums of 1979". ^ "Les Albums (CD) de 1979 par InfoDisc" (PHP) (in French). infodisc.fr. Retrieved 11 February 2012. ^ 1979年アルバム年間ヒットチャート "Japanese Year-End Albums Chart 1979" (in Japanese). Oricon. Retrieved 12 September 2011. ^ "Complete UK Year-End Album Charts". Retrieved 4 October 2011. ^ Billboard.com – Year End Charts – Year-end Albums – The Billboard 200. Retrieved 4 October 2011. ^ "Canadian album certifications – Bee Gees – Spirits Having Flown". ^ a b "Bee Gees" (in Finnish). ^ "Les Albums Or" (PHP). infodisc.fr (in French). ^ "IFPIHK Gold Disc Award − 1979". ^ Kendall Agee, Warren; Phillip H. Ault and Edwin Emery (1 January 1982). Perspectives on mass communications.